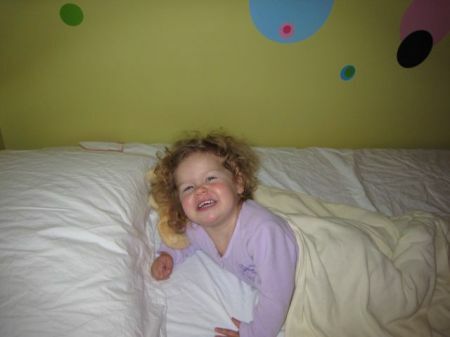 On Saturday January 20, 2007 Mara slept for the first time in her big girl bed. Thanks Auntie Jen for providing the bed! We thought there might be some sleepless nights on the horizon but we were totally wrong and very happy for it. That day during naptime was her first chance to sleep in the big girl bed. She did really well and when I heard her start talking I went in to get her but she was already out of the bed and heading for the toys to play. Then we thought she might be a bed escaper now but we totally lucked out because that night and every time after atleast until this point she has never left the bed even for naps until we come to get her. 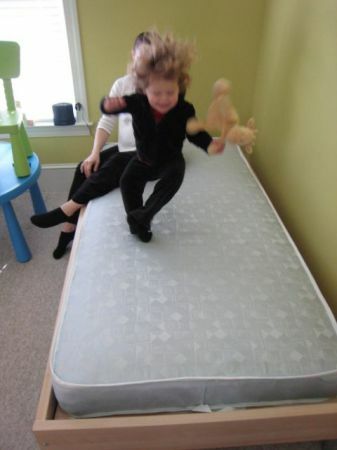 You can see during set up of the bed she was really enjoying the bouncing on the bed. We even caught her mid air! I think the transition has been an easy one. Maybe because only her bed changed and not her room. We decided instead to put the new baby boy in a different room instead of having her give up her space. We are in the process of giving her room a different and more “big girl” feel. 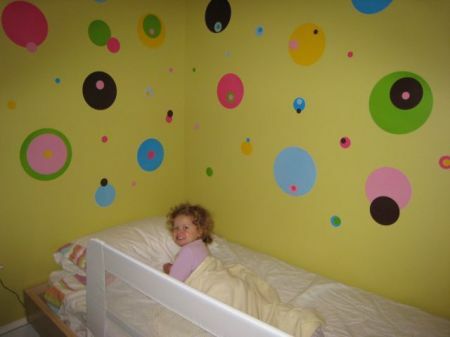 You can see by the pictures we’ve added some wall decoration called candy wall arts in the pattern, Dots. She really likes them but I’m afraid one day I’ll walk into the room and she will have peeled them off the wall. So far so good. How did we end up with such a sweet, easy going and well adjusted child? Beats me, but we are praying hard for the second one to come out with a temperment as close to this as possible!!! Besides vacuuming Mara really enjoys cleaning up with a paper towel or rag of some sort. I imagine she sees us doing it so much after she has had a meals, etc. that this is where she picked up the idea. She’s been cleaning up for a couple of months now. The interesting thing is that she also likes to use a little moisture in her job. Also known as let me spit a little then I’ll really have something to wipe up. It really cracks us up. Hey atleast she’s trying right? The rest of the pictures are a hoot too, so click on this one to see them! One of the things that is the most trouble with little ones is trying to get them to not make a mess on the floor during dinner time. It is a losing proposition. 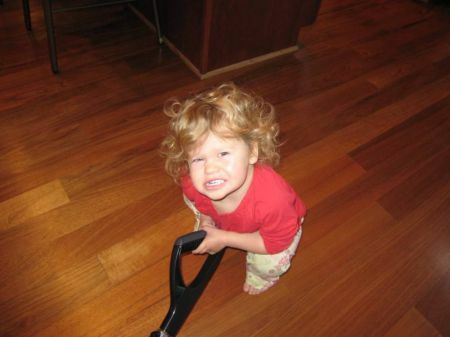 Since moving to the new house we really didn’t get anything to help us clean up the messes… until now. We finally bought a battery powered sweeper, or low powered vacuum. Its good enough for the job we wanted it for, little crumbs under Mara’s seat. What we didn’t expect is that someone else in the house would BEG to do the cleaning. Not sure what it is about this contraption, but Mara wants to go around cleaning whatever she can. She loves it. More pictures if you click through. Last weekend we took a little trip down to Charlotte to visit some friends that we hadn’t seen in a little while. Little while isn’t an exaggeration either. The last time we had seen the King family there were only two and both Nadine and Steph were pregnant. 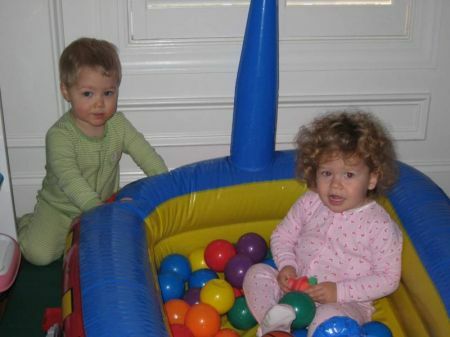 A few months later, Lucas was born on February 19th and Mara was born on February 22nd. So here they are, almost two years old before they get to meet each other. It was fun to watch them play together. They were a little timid at first, but soon they got used to it and were yelling “mine” at each other… just the way it should be. 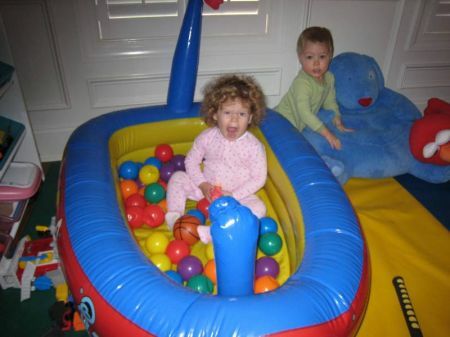 Most of the pictures we have are Luke and Mara in the toy room on Sunday morning. They had a blast. 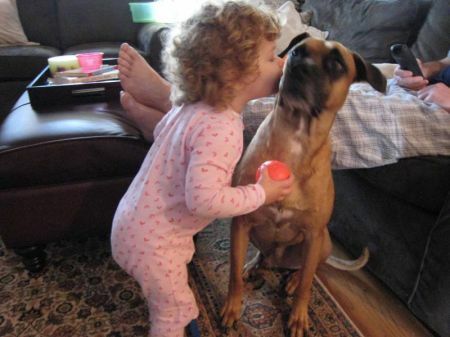 Later Mara had the joy of spending some time with George and showering him with kisses. I’m not so sure she was ready for what was in store, as George can lay the slobber on pretty thick. Unfortunately we didn’t get any pics of Megan, but Mara really enjoyed seeing both doggies. We hope that Luke, Darrin and Nadine will come for a visit to our neck of the woods soon. See more pictures by clicking through any of the ones shown. Nana got Mara a 4 x 4 play truck that is battery operated. Mara couldn’t ride it the day Nana brought it, since it had to be assembled and charged up. But a couple of days later Mom took Mara outside to try it out. She had ridden something similar over at her buddy Parker’s house. 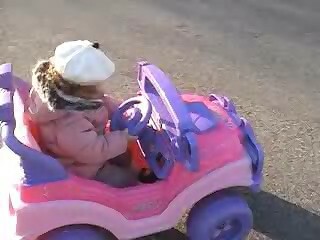 She’s not exactly an expert at getting around in it yet. Coordinating the gas and the steering takes some practice. It doesn’t help necessarily that she was in her Michelin Man coat. I think the main objective for Mara is to push her foot. Watch the video and you’ll understand. One of Mara’s favorite activities is to go outside whenever she can. If you happen to go to daycare at the wrong time and the kids are outside, good luck in getting Mara to leave. While outside at home one of Mara’s favorite things to do is to get you to blow bubbles for her to chase around. 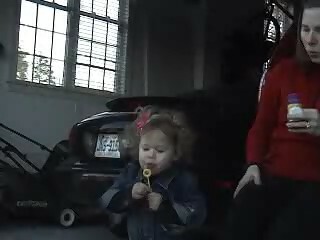 The day this video was taken a few weeks ago, Mom took some time out to show Mara how to blow her own bubbles. She got to be pretty good at it. Bonus? Seeing Mara in her hot pink leopard print pants. Rawr, rawr. In the last few weeks Mara has gained quite an appetite. For a little while there in the fall she seemed to be pretty particular about what she would eat and would not eat. She had some favorites that could be relied on to satisfy her, but eating anything you put in front of her had gone along with her baby months. Now it seems it is back where she has a wider range of likes. This video was taken a few weeks ago where we caught her enjoying some chicken mini biscuits. Its a easy sign that she likes it from the noise that accompanies every bite. Yumumumumum. You even get to hear how she gulps down milk. 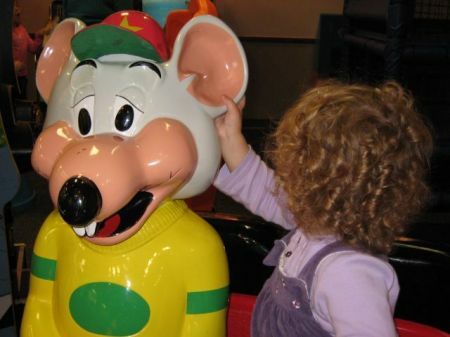 Chucky Cheese!!! 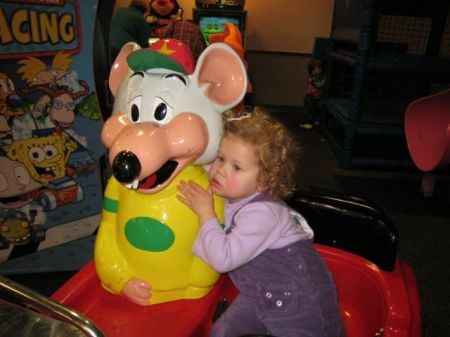 Mara had a great time on our last day of 2006 since it was spent visiting Chucky Cheese for the very first time. They actually had quite a few things that an almost 2 year old can do as you can see by the pictures. 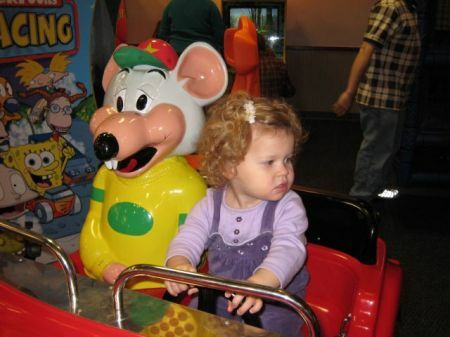 I think her favorite was the Bob the Builder ride because she kept saying, “again” everytime the ride came to a halt. I think she rode it a total of 5 times that night. As a side note Luke said he thinks the pizza they serve is better now than he remembered as a child. We are grooming a pro air hockey player as you will see in the pictures by the way. 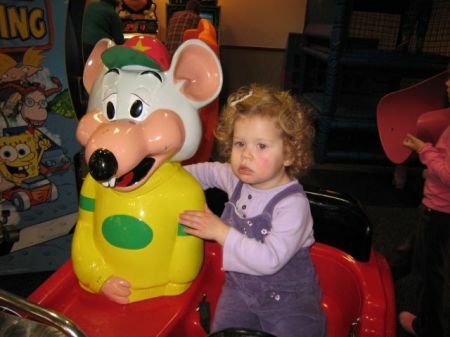 Check out how she gradually warmed up to Chucky when she was sitting next to him in the car.